A detox diet often requires you replace a normal meal with a vegetable or fruit juice, like orange juice. The idea is to remove solid foods from your diet temporarily and rely on fresh vegetables and fruits to quicken weight loss and get rid of unhealthy toxins. Some versions of the diet require you consume nothing but fresh squeezed orange juice and water for up to two weeks. Substituting orange juice for a meal should not jeopardize your health, but limiting your nutrient intake to nothing but oranges is not recommended without a doctor's supervision. Before you start a diet that uses orange juice as a staple, consult your doctor. Examples of detox diets that include orange juice are the Martha's Vineyard Detox Diet and the Liver Cleansing Diet. For 21 days on the Martha's Vineyard Detox Diet, you are to avoid all solid foods and instead consume fruit juice, vegetable juice and protein shakes. For eight weeks, you are permitted only raw vegetables, fruits, grains, nuts, seeds and juice. Two liters of fresh orange juice each day is permitted on the Liver Cleansing Diet. An orange juice diet is also recommended as part of easing out portion of the detox diet known as the Master Cleanse. After fasting without any solid food for several days and only drinking a concoction of lemon juice, water, maple syrup and cayenne pepper, you ease out by spending one day drinking 2 to 3 liters of orange juice. After juicing for a day, you can start eating whole foods, such as fruits and vegetables again. 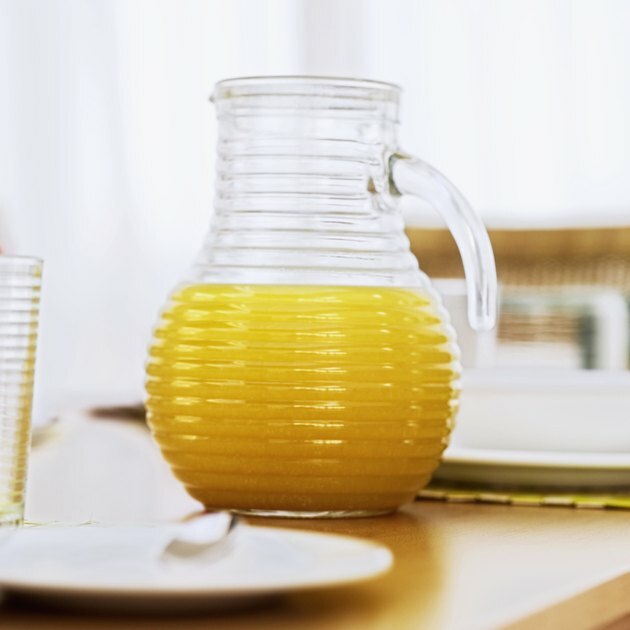 If you drink too much orange juice, you may actually hinder your weight loss efforts. A glass of orange juice from concentrate contains approximately 120 calories and 20 grams of sugar. When you do drink orange juice, choose lower calorie versions. For instance, Trop50 from Tropicana has 50 percent fewer calories and 50 percent less sugar than the company's regular varieties. You do not need a detox juice diet to remove toxins from the body. Toxins are naturally removed through bile and urine after passing through the liver and kidneys. You may drop weight quickly on an orange juice diet due to decreased calorie intake, however once you eat solids again and increase calorie intake, the weight will pile back on. Keep in mind that orange juice is not the magic bullet for weight loss. Although orange juice is high in nutrients, such as calcium and vitamin C, it should only be part of a healthy and well-rounded diet. To lose weight, eat a diet full of vegetables, whole grains, fruits, lean proteins and reduced fat dairy products instead of relying on a fad juice diet. Fitness Magazine: What Is a Detox Diet?